In the Career and Internship Services office we offer different assessments. They are personal inventories that allow you to ask questions about yourself and find out who you really are. We have the Myers-Briggs Type Indicator, the Strong Interest Inventory, and StrengthsQuest. I have taken all of these and they have really taught me a lot about myself. I took them all my freshman year when I first started working in the office. The results of these assessments have become a part of me and they are how I describe myself and what I put on my resume. Recently for my Principles of Marketing class, my professor told us that we were going to take the StrengthsQuest to be able to better work with our group members for our semester project. I, of course, tried to get out of paying the $15 fee by saying that I work at Career and Internship Services and I had already taken it. However, much to my chagrin, he said I would have to take it anyways. I got the assessment and I plugged the code into my computer. I was in my own space and was thinking “ugh, I already know all about myself what do I have to do this again?” I put in all the required information and started answering the questions. The assessment gives you two spectrums and you are supposed to pick if you lean more towards one option or the other. I started clicking through, having a hard time picking whether I was more one way or the other on a lot of questions. Was I more caring or analytical? Do I like group projects or do I like to work independently? Even though I knew what to expect, I still struggled my way through the process and about thirty minutes from my start time, I was finally finished. My results popped up on the screen and they were positivity, focus, developer, strategic, and achiever. I was shocked, I didn’t think I was some of these things at all. I decided to go back to look at the results of my first StrengthsQuest and to my surprise, they were almost all different. My first results were communication, strategic, individualization, woo, and activator. I almost felt cheated. I felt like I had to have answered the questions wrong and that I should get a redo. I came into Career and Internship Services after I took my assessment and I mentioned that I retook the StrengthsQuest and that all my results were different. The counselors explained to me that even though my top 5 weren’t the same, they were probably still in my top 10 out of 34. They also went on to explain that these new strengths show how I have grown as a student and as a person over the last two years. I started out with strengths that identified me as a people pleaser who wanted to win everyone over and made quick decisions. Now I am a positive worker who likes to analyze situations before making a decision by coming up with plans to get things done by focusing on my goals. It wasn’t bad that I changed, it just showed that I am a normal college student who is growing into the person I really want to be. If you’ve already taken the StrengthsQuest, I really encourage you to take it again. Especially if you took it in a prerequisite freshman or sophomore level class. If you are a junior or senior who is preparing to go into the “real” world, this is something that can be of huge value to you. Yes, it is $15, but I think it’s worth it to cut out the two trips to the food court to find out about who you really are and how you have grown. If you haven’t taken the StrengthsQuest, then I would absolutely tell you that it is a valuable experience and I would HIGHLY recommend taking it. If you have any questions come down to Career and Internship Services and we would be happy to help you! If you read my previous blog post, you are well aware that human resources is what brings business and people together. But how do you know if this is a good career for you? Back in the day (just a mere two years ago), I came into the Career & Internship Services office to take the Strong Interest Inventory assessment, which helps determine what occupations may be best for you based off of your interests. Human Resource Management (HRM) was in my top ten and it was during this time I began taking the possibility of majoring in Human Resource Management seriously. Fast forward to a few months ago, when I took the StrengthsQuest assessment to figure out what qualities I naturally excel in and can use to market myself. This is when I began seeing HRM in who I was and who I wanted to be. My top strength is woo. This comes from my love of meeting new people and winning them over. I enjoy breaking the ice and making a connection with other people. While this has always been something that came naturally to me, I didn’t realize how much woo plays into the role of recruiter. One of my career goals after graduation is to become a company recruiter through which I can connect with college students, win them over for my company, and help them reach their goals. My second strength is positivity. Those with positivity tend to have an enthusiasm that is contagious; they are upbeat and can get others excited about what they are going to do. My other area of interest in HR is training and development. If I want to get people on board with spending days, weeks, or months learning new skills and making new goals, I need to have a positive attitude and make it a fun experience for everyone. My third strength is empathy, meaning I can sense the feelings of other people by imagining myself in their situation. Empathy is an important strength to have if you are going to be working with a diverse group of people. Through empathy, I can connect, relate, and understand others’ situations as their manager. Being able to put myself in the starting place of another person and work with them toward the next step is a valuable tool to have. My fourth strength is includer. Someone who is an includer shows awareness of those who may feel left out and makes an effort to include them and accept them. Part of human resources is solidifying culture within a company. What do employees want? What makes them feel valued? How can we accomplish our goals and still provide a friendly, encouraging work environment? My strength of includer helps me value and view company culture on a different level than most and provides opportunities for me as a human resource manager. My fifth strength is developer. As a developer, I recognize and cultivate the potential in others, and as a manager, I lead and navigate a group of people. Putting others in positions that empower them and make the business run smoothly is part of not only a manager’s job but also human resources. This strength helps me lead others into roles and opportunities they desire. Come into the office and learn your strengths! Like me, they may help you visualize your future career and find what areas you can excel in! In the Career and Internship Services office, we focus a lot on our strengths. This year I have looked into these strengths more than I have ever before. I think by looking at your own strengths it can not only help you by helping yourself see these strengths and apply them, but it can also help you by identifying your weaknesses. I also have found it helpful to look at the effects of two different strengths on every day situations. All of this information can be helpful in your knowledge of personal development. Sometimes having certain strengths can make a situation more difficult. In my own experience I have had discrepancies because of where my strengths lie. Two of my highest strengths are harmony and positivity, and I am not complaining about this, but sometimes they can be troublesome. Since positivity is one of my top strengths, I strive for a positive environment. Being in a negative workplace or environment would be physically and emotionally draining for me. This is why I enjoy working here at Career & Internship Services and my job at a Golf Course, because they are overall positive work environments. For a brief period I was considering going into alcohol and drug counseling, because I find the subject of chemical dependency to be very fascinating. But with my knowledge of strengths I knew going into a job where the subject matter is mostly negative would probably not be ideal for me. As I said earlier, harmony is also one of my top strengths. Now there is nothing wrong with harmony, but sometimes it can get in the way of things. Since I score high in harmony I prefer an environment where people get along and work together well. In the past I have worked in jobs where employees would bicker or talk behind each others backs, and I did not enjoy those situations. I am the type of person who tries to be nice to everyone, so when I was brought into these fights between coworkers I felt very uncomfortable and it made my experience there much more stressful. But having harmony can also be tough in other situations, such as confrontation. Since I like for everyone to be on good terms, I find it hard to confront people about big issues. I am not saying I completely abstain from confronting anyone, I just find it uncomfortable and try to avoid it if possible. This is why I would prefer to work in a workplace where there is positivity and harmony. I think it is essential to know your owns strengths and weaknesses to see what kind of work environment you would prefer to work in. After I assessed my strengths I could see I would prefer to work in an environment that is positive and harmonious. If I had not looked into these strengths I may have made the mistake of going into a less positive job. Yes, the combination of positivity and harmony can be deadly, but it also allows me to create a positive and healthy environment for the other people I work with. In a previous post, I wrote about how I use the Deliberative strength from the StrengthsQuest assessment. For this post, I’ll focus on another strength in my top five: Empathy, my number one strength. Those with the Empathy strength are able to sense how those around them are feeling and can take on those feelings as their own. They instinctively understand others, and can see things from their perspective. To clarify, empathy is different from sympathy. Sympathy is feeling sorry for others – it is a more surface-level action. Empathy is a deeper sense of understanding the situation of another and feeling with them rather than for them. Empathy can be very beneficial, but it also needs to be “controlled.” It is easy for empaths to become overwhelmed by the feelings of others, and if they don’t find a way to protect themselves, they can become incredibly drained. Here a few things I’ve learned about how to use your empathy rather than be controlled by it. Learn to detach your life from the lives of others. I’ll be the first to tell you this is ridiculously difficult. If someone I care about is struggling, that struggle will occupy my mind, too. But, you need to try to not feel guilty for allowing yourself to have your own feelings separate from another’s. It’s perfectly okay to compartmentalize and experience your own feelings and happiness even when those around you aren’t experiencing those same feelings. Think about it – if we all felt sadness at the sadness of others, our entire population would be down all the time. It’s not easy to release yourself from your empathic feelings, but it’s an important skill to learn. Understand that not everyone has the same level of empathy as you. Not everyone is empathic, and that’s okay. Feeling empathy is one of many ways a person can interact with those around them. As an empath, though, it can be difficult when you interact with others who don’t have the same empathic tendencies as you. Not everyone will be able to quickly and easily feel what you’re feeling and understand what you’re going through. For this reason, you need to be patient when you feel like others are being rude, inconsiderate, or insensitive toward you or someone else. That’s not necessarily the case – they probably just have a different set of strengths than you. Find activities or a job that allow you to work with others. While it’s important to learn how to flip your empathy switch off, it is also important to find opportunities where you can have it on and let it shine. Being an empath allows you to relate to others and work with them on a deeper or more meaningful level. Being able to pick up on a person’s feelings helps you adjust how you work with them to make the interaction more effective. Find a job or another space where you are allowed to do this, because the result can be incredibly rewarding. Work in a place that has the energy you need. Empaths can easily feed off of the energy of others, so it’s important to make sure you’re surrounding yourself with the energy you need. For me, that means a positive, optimistic environment. I’ve worked in both positive and negative environments, and in both situations I have adopted the positivity or negativity that surrounds me. Living with constant negativity wears me down, while living with positivity helps me do my job to the best of my ability. Find a workplace where the energy matches your own and allows you to do your best work and enjoy it along the way. Happy surroundings make for a happy empath! The career assessments offered at the Career and Internship Services Office are very beneficial in many ways. These assessments can help you target your strengths, where your interests lie, or find out more about your personality. Some people just take one or two of these assessments and learn from the individual results, but by taking all three and comparing results you can learn a lot more about yourself. You can observe where similarities may lie, or where there may be some differences. In my experience, comparing all three assessments helped me realize more about myself, and it helped me realize how I can incorporate these results into my everyday life. My favorite assessment by far was StrengthsQuest. I really enjoyed seeing where my strengths lie and which strengths were the most prominent in my life. My top five strengths are consistency, harmony, positivity, includer, and futuristic. I found it helpful to learn this information because I can see where I excel, and I can also see where I may need improvement. After receiving my results, it made me more aware of these strengths I possess, and I felt more inclined to use them in my professional and everyday life. An example would be the fact that I have consistency as a top strength. I use this in my job by providing the same customer service experience to everyone who walks in the door. I treat everyone the same and do not give special treatment to some. I think consistency is a very important skill in my line of work. So just realizing what your skills are can benefit you in many different ways. It is important to look at similarities between the different assessment results. By doing this you will make sure you get the most out of the assessments. I began to look more into my results to see if there were any similarities I could find. One theme I found throughout all of the assessments was communication and being social. On the Myers-Briggs I showed preference as an extrovert, and on my Strong Interest Inventory my highest theme was Social. I thought this was very accurate and I was not surprised this theme came up in each assessment. I like to work with people and I like to communicate with others, so I think it is accurate to have social themes on each of my assessments. Another theme I noticed multiple times was being futuristic. As I said before, Futuristic is one of my top strengths on StrengthsQuest, but I saw evidence of this in the Myers-Briggs Type Indicator as well. I showed a preference for Intution, which means I will probably prefer an occupation that permits me to focus on the future, envisioning the possibilities of a person or a situation. I find this to be true. I consider myself a rather futuristic person. I am constantly thinking about the future and how my actions now may affect me down the road, so I was not surprised when I saw futuristic as a common theme on these assessments. Another similarity I noticed in my results was feeling and people skills. The Myers-Briggs told me I was more on the feeling side, which means I would prefer an occupation where I would focus on people and process issues rather than the technical problems. It also means I would try to understand the particular needs or contributions of the individuals with those I work with. I think this relates to my results from the Strong Interest Inventory where Social was my top theme. This shows I prefer to work with people and be social with them, as opposed to working alone and focusing on technical details. I think I learned a lot more from comparing my results from all three assessments. If I had not compared my results I may not have believed them as much, but after I saw physical evidence of these skills in multiple assessments, it made me very confident in the assessments’ accuracy at describing me. I believe everyone should review their results from all three of the assessments we offer, because you can learn a lot more about yourself than you would if you only looked at your results individually. Trying to choose a package of shredded cheese from a wall of choices stresses me out. When ordering food or drinks, I frequently just echo one of my friends’ orders. I over-analyze and consider each possible answer on Buzzfeed quizzes. It takes me a long time to make any decision, regardless of how simple or complex it is. Basically, I’m deliberative. Sometimes to a fault, as in the times just listed. Other times, it’s definitely to my advantage. Deliberative is one of 34 possible strengths you can get on the StrengthsQuest assessment, and it happens to be in my top 5. Those who have the Deliberative strength are careful, cautious, and anticipate the potential risks and obstacles associated with each decision. While they don’t always act quickly and aren’t the first ones to pipe in with their thoughts, those actions and thoughts are typically logical, reasonable, and beneficial to those affected. It’s a little tricky to be a deliberative person, and it’s easy to let this strength take over. Here are a few things I’ve learned about controlling the deliberative nature and getting the most out of it. Don’t assign too much weight to the small things. Deliberative people have the tendency to look at all problems similarly, seeing an array of solutions to be considered to reach the end goal of making a solid decision. This is a great strength to have when it comes to the bigger decisions, but for the smaller ones, this in-depth consideration isn’t necessary. 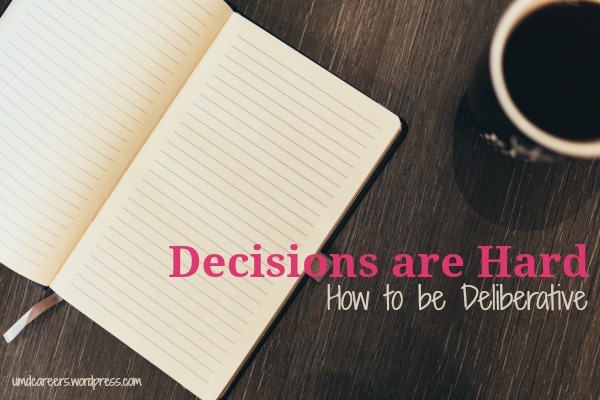 It will take practice, but try to fight the urge to treat every decision as significant. For me, this means consciously reminding myself that it doesn’t actually matter if I choose a fox or an owl as my favorite animal or if I order pancakes or waffles. If you won’t remember that decision a year or even a week or month from now, it’s probably not that important. Make lists. Make all the lists. When making decisions, lists are the loyal, trustworthy, comforting best friends to keep by your side at all times. Need to figure out where you want to go to grad school? Make a list of where in the country you want to go, followed by the list of schools in those places, followed by the things you’re looking for in a program. Don’t know what you want to major in, but know what you’re kinda sorta interested in? Make a list of your interests and the classes you can take in those areas to help you rule out the ones that aren’t for you. Keep lists of what things you do and don’t like about the classes you take, the jobs you have, or the things you’re involved in to make sense of your experiences. Making lists is one of the most reliable ways to soothe the deliberative soul. Seek out all of the advice you can. Find advisors you trust who can help you see all your options, narrow them down, and choose the one that is best for you. These people need to be patient with you and genuinely interested in you as a student and person. Whether it be an academic advisor, an instructor, a career counselor, or some other person, having someone who can help you deliberate will be invaluable in your decision-making processes. Finding people who can walk through your options with you or who have knowledge or experience in areas you know less about can provide you with the information you need to make a decision you’re comfortable with. Find environments that allow for deliberative thinking. Seek out places and people that allow you to think independently and make decisions on your own, but also provide you with opportunities to ask questions and learn from others. Avoid environments that require you to constantly make quick decisions or don’t allow for deeper thought. Choose to spend time with people who will be patient with you as you struggle to choose between pasta or soup, and be just as patient with yourself. Also, if tomato basil soup is an option, I don’t even know why you’re considering any other choice. So can this assessment only help you in an interview? The short answer, no. These strengths can also help you develop your resume. Knowing these strengths can help you determine and showcase what you do well on a resume, which is very important since your resume is often your first impression with an employer. How can you incorporate these strengths into your resume? There are many ways to display your strengths on a resume depending on what they are. To show you what I mean, I have listed my strengths (along with the official definitions of each strength from the StrengthsQuest website) below along with my resume. 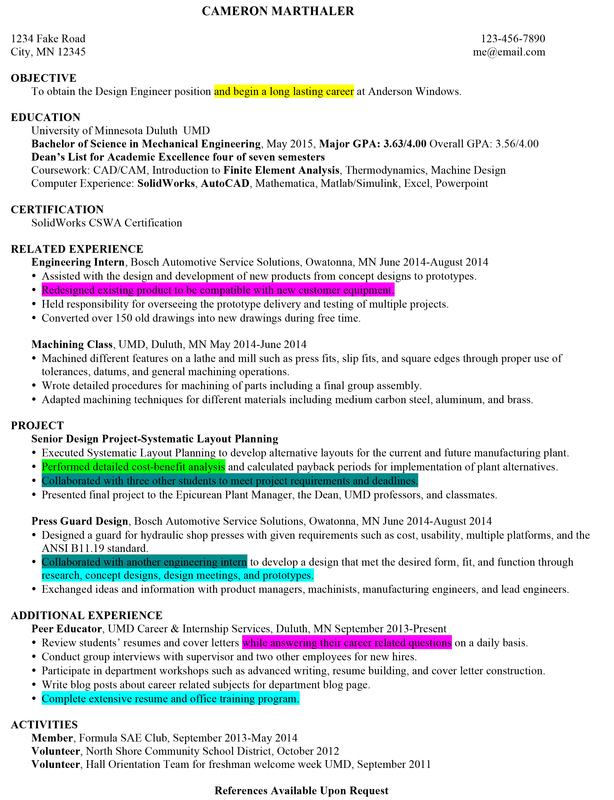 On my resume I have highlighted areas where I felt certain strengths are shown. To read more about Strengths and how each Strength can be used in the career exploration process, check out our StrengthsQuest section here on the blog.